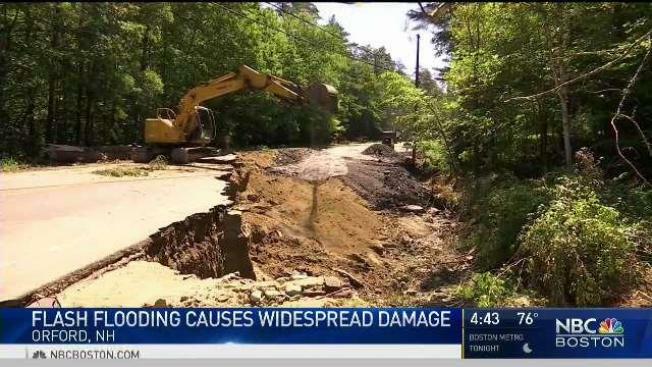 Wednesday was another long day of rebuilding and cleaning up in central and northern New Hampshire, after furious flash flooding this past weekend wreaked havoc on roads in several communities. One of the hardest-hit locations was the town of Orford. Road crews have been working overtime there to reopen Route 25A. The road washed away entirely in one spot, where a critical culvert runs through, and was left looking like Swiss cheese in many other places. Flash flooding knocked out a home's foundation on Brook Road, just off 25A. “These little tiny tributaries all over, when the rain starts, they turn into raging monsters,” said Michael Galli, the dean of students at Rivendell Academy in Orford, who was photographing storm damage Wednesday. Orford's Scott Gagnon was broadcasting on Facebook Live from his front lawn Saturday night, during the torrential storm that spawned the destructive flooding. “The road’s getting cray-cray,” Gagnon marveled during the live broadcast, looking at water racing across his lawn and the road. When all that violent water receded, the homeowner saw it had carved out a massive chunk of his yard, along with a section of 25A. “I always knew water could be dangerous, but I was just shocked this wasn't even a hurricane and we had five inches,” Gagnon told NBC Boston. The closed or damaged sections of road are going to have a significant impact on a major charity event in the area this weekend: the Prouty. The long-running event has several thousand bicyclists raising money for the Norris Cotton Cancer Center at Dartmouth-Hitchcock. However, some of the course was supposed to go right through 25A, so the Prouty had to cut, shorten, or redirect many of its bike routes, out of concern for safety. The executive director of the event said the Prouty still expects to raise nearly $3-million for the cancer center. Another example of that can-do attitude could be seen in a sign a homeowner put in her yard on 25A. Even with the community facing significant work ahead, the sign reads, "Orford Strong."